Heavy rain in the forecast for S and SA Iceland today until just after midnight. Snowmelt increases river flows and increased river levels can be expected in the area. These conditions can result is increased risk of mudslides in the mountains. Geysir og Gullfoss: Lower trail to Gullfoss has opened but the edges are risky as always. The road from Reykholt is in bad shape – a lot of holes and puddles when raining which can easily pop a tire if not careful. When walking from parking lot to Geysir one must be careful as the stone slabs are very uneven. Hraunfossar og Deildartunguhver: Nothing remarkable about the conditions but it’s worth mentioning that the trail up to Eldborg in Eldborgarhraun lava field is extremely muddy! Snæfellsjökull National Park: Roads 570 and 571 over the glacier is closed! Trails have most been fixed to accommodate those who struggle with walking but many side roads are in bad shape. Road to Hólavogur is impassible. 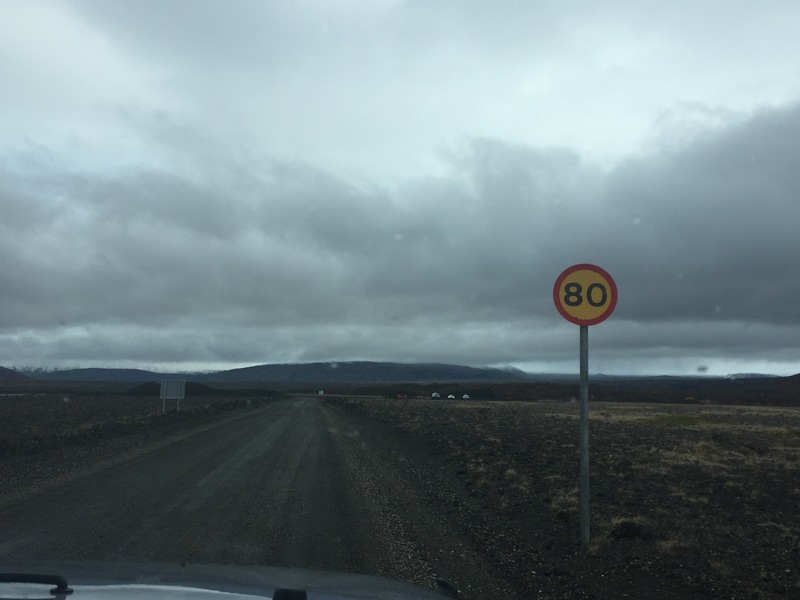 Southern Westfjords: Construction work at Dynjandi so all indication signs have been removed. Many of the gravel roads are in really bad shape – outer parts of turns should be avoided due to deep patterns in the wet mud. Big holes have formed in front of bridges on these roads so it’s important to reduce speed before crossing. Hvítserkur: Road 711 from the ring road is in bad shape with big holes – road through Hvammstangi and past Vatnsnes is much better. Good to keep tides in mind if wanting to explore the rock closely. Mývatn: Longer trails in Dimmuborgir are still icy but no need for crampons. Walking over Leirhnjúkar is not recommended as there’s still snow covering the trail and it’s dangerous to go outside of the trail due to hot springs. Dettifoss og Selfoss: Difficult hiking conditions – not for those who struggle a bit with walking. The trail is 1 km and is very wet and slippery. Plank bridges have been put over the worst puddles. Important to wear good footwear – with course patterns and waterproof. Hengifoss: No snow but the area can be very wet due to the heavy rain! Reynisfjara: When winds blow from the south the waves can be very big. The beach can always be dangerous though due to the unpredictability of the waves. It‘s not every wave – it‘s every 7th or 10th or 12th wave that goes a lot further up the beach than the rest making it difficult to assess danger upon arrival. There are no rocks in the ocean that break the waves and only a few meters of shore there‘s an underwater cliff so the pulling factor of these already powerful waves becomes even greater. On top of this the sand is very fine ash which makes it extra difficult to get away from these waves. Þórsmörk/Goðaland: Closed/Impassible for those not in a modified vehicle. Staff will remain in Húsadalur throughout the winter. Area is very wet and increased flow in Krossá – river is about 1 m. deep when it’s been raining like this. Trails in the area are also muddy. Vestmannaeyjar: The ferry will depart from Þorlákshöfn today but announcements can be found on www.seatours.is (top of website). Landmannalaugar: Conditions are bad – winter is leaving and everything is very wet. The warden did not recommend any vehicle to drive there as river levels are high and road conditions very bad. Driving ban expected in the next few days. Esjan: Must not be underestimated! Considerably colder up top than by the roots and wind often increases after 250 m. Warm clothing is essential! Watch your step as it is very slippery past Steinn! Skaftafell: S1 (Jökulslóð) and S2 (Svartifoss) are open yet the last stretch from the lookout down to the waterfall is very muddy! Other trails closed due to mud! SA of Vatnajökull: Trails in the area are very wet. Increased flow in rivers and creeks. To access trails towards the glacier one must take gravel roads which can be in bad shape with holes and muds. The 15 km trail around Stafafjöll mountains is very wet so good footwear and gaiters must be kept in mind as well as it‘s very important to stay on the trails! Reykjadalur: CLOSED due to muddy and hazardous conditions. Situation is closely monitored and Umhverfisstofnun will announce the opening when time comes. Ásbyrgi: Snow is melting – wet for the next few days. Glymur: Log over the river Botnsá will not return until next month so hikers must take a longer route over the old bridge along the hiking route “Leggjabrjótur”. Moderate danger (level 2/5) in Tröllaskagi peninsula and Eastfjords.